Congratulations to Archbishop Joseph W. Tobin, C.Ss.R., who today was named Archbishop of Indianapolis, IN. A native of Detroit, and a member of the Redemptorists’ Denver Province, he succeeds Archbishop Daniel Buechlein, OSB, who retired in 2011 for health reasons. Since then, the Archdiocese has been cared for by Auxiliary Bishop Christopher Coyne. 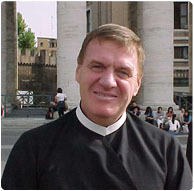 Archbishop-designate Tobin served for two terms as Superior General of the Congregation of the Most Holy Redeemer from 1997-2009. He was appointed secretary of the Vatican’s Congregation for Institutes of Consecrated Life and Societies of Apostolic Life in August 2010, and was ordained a bishop in Rome in October of that year. During his short tenure with the Vatican office, he oversaw the end of the Vatican’s visitation of U.S. women’s religious orders. He was also appointed by Pope Benedict XVI as one of the apostolic visitors to the church in Ireland in the wake of the abuse crises. Archbishop Tobin’s installation is slated for December 3, 2012. The Redemptorists of the former St. Louis Province served in St. Joseph’s Parish in Lebanon, IN (in the Lafayette diocese) from 1927 to 1972. Currently there are no Redemptorist foundations nor Redemptorists serving full-time in the state, although Redemptorist mission teams still evangelize the area. Please join us in praying for Archbishop Tobin as he assumes his new ministry. Our Mother of Perpetual Help, pray for us!